How does the quick adoption of technology affect business success (and how is that related to corn farmers in Iowa)? And how is the Internet itself affecting the way we experience the world? 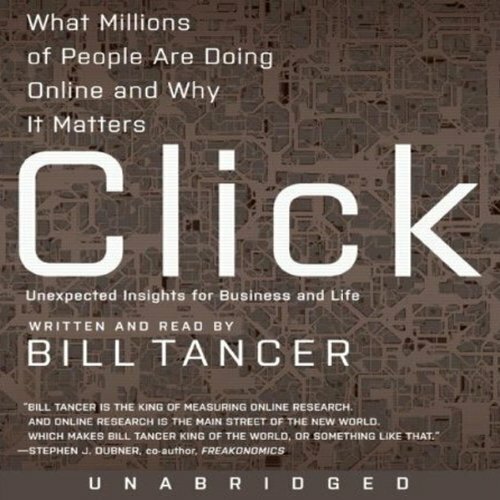 In Click, Bill Tancer takes us into the massive database of online intelligence to reveal the naked truth about how we use the Web, navigate to sites, and search for information - and what all of that says about who we are. Tancer demonstrates how the Internet is changing the way we absorb information and how understanding that change can be used to our advantage in business and in life. Click analyzes the new generation of consumerism in a way no other book has before, showing how we use the Internet, and how those trends provide a wealth of market research nearly as vast as the Internet itself. After all, we are what we click.